Baba Ramdev is an Indian spiritual leader. He is well known for popularizing yoga, ayurved in India. Ramdev also gives his opinion on different social issues. 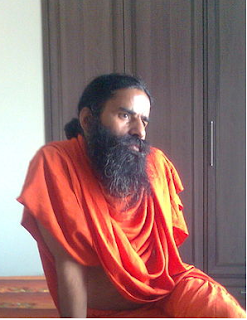 Baba Ramdev’s original name is Ramkrishna Yadav. He was born in Mahendragarh, Haryana on 26 December 1965. His father’s name is Ram Nivas Yadav and mothers name is Gulabo Devi. He took his name Ramdev from his father’s name. Baba Ramdev did not completed his education in school. After the 8th standard, he left school and started learning yoga and Sanskrit from various gurukuls. He became sanyasi and went to Himalaya for some time. Acharya Pradumn was his guru. He became public face in 2003, when Aastha TV broadcast his teachings of yoga. Within few years he made a large number of followers. He has also taught yoga in Britain, Japan and USA. Many celebrities including Amitabh Bachchan, Shilpa Shetty has also taken his lesson on yoga. Baba Ramdev alos took participation in the anti corruption movement. At the Ramlila Maidan, New Delhi on 27 February, 2011, he joined with Anna Hazare in the anti corruption movement. On 4 June 2011, Bhrashtachar Mitao Satyagrah was launched by Ramdev. In 2007, Kalinga Institute of Industrial Technology, Bhubaneswar honored him with a doctorate degree for his work in yoga. Maharashtra Governor K. Shankaranarayanan honored him with Sri Chandrashekharendra Saraswati National Eminence Award in 2011. Honored with Sri Chandrashekharendra Saraswati National Eminence Award by Maharashtra Governor K. Shankaranarayanan.